In our generation where being on-the-go is a standard, having access to you trading account 24/7 is a must. That is why the lot of binary options traders seek trading platforms that are also available through mobile versions. And since our Banc de Swiss mobile trading platform is 100% web-based, our traders can gain access to their accounts anywhere, anytime. Below are some of the frequently asked questions with regards to trading binary options using our Banc de Swiss mobile platform. Where can I get a mobile trading account? Our mobile trading platform can be used by any of our members anytime, anywhere. You don’t need to open a new account or sign up for a mobile trading account. Just use your regular account with Banc de Swiss. Mobile trading is pretty much similar with trading using a computer, except for the fact that it allows you to move to places, without leaving your open trades and logging out of your account. Furthermore, opening a Banc de Swiss trading account is completely free. All you need to do is to register through our website and fill in the necessary information. After you’ve accomplished all details, you can readily gain access to our website as one of our traders. And once you have an account with us, we already give you the privilege to use our Banc de Swiss trading platform and start earning. With our advanced mobile trading platform, endless earning opportunities await you. Now, there’s nothing that can hold you back from achieving success in binary options trading. 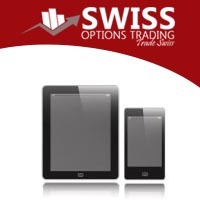 How can I use Banc de Swiss mobile trading? If you’re wondering where to download our mobile software, then you probably will not find an answer. This is because our mobile trading platform can be accessed through your smartphone’s browser. Hence, you don’t need to download any application or software to trade binary options using our mobile version. Since our binary options trading platform is completely web-based, you can enjoy trading various assets just like you do when you’re using your personal computer or laptop. The difference comes in when you take note of the screen size. Obviously, your computer’s monitor is much larger than your smartphone’s screen. So when you’re trading binary options using your mobile, one thing you should get acquainted with is the screen size. Although this is a minor concern for most users, trading binary options through our Banc de Swiss mobile version would require you to use your smartphone’s features such as the pinch to zoom function. You can trade assets, open and close options, and do almost everything that you do when you’re trading using your laptop computer. What assets are available for mobile trading? Same with the asset index you use when trading options in your personal computer, the assets you can trade through our Banc de Swiss mobile version consists of various markets, namely the Stocks, Indices, Commodities, and Forex currency pairs. You can trade the assets you’re most familiar with. For example, if you mostly trade Apple stocks when you’re logged in using your computer, then you can also trade this same asset when you’re using our mobile platform. Moreover, there are practically no restrictions to what assets you can trade through mobile; it’s just like in our PC version, but with no wires attached.